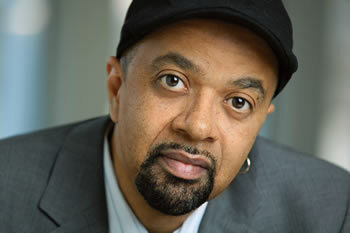 The Farquhar College of Arts and Sciences welcomed bestselling author and musician James McBride as the first guest of the college's 2014-2015 Distinguished Speakers Series. McBride is the author of The Color of Water: A Black Man's Tribute to His White Mother, the college's book selection for the 2014 First-Year Reading Program. McBride's narrative explores the complex identity of his mother, a white Jewish woman from Poland who married a black man, founded a Baptist church, and put 12 children through college. McBride's second book, Miracle at St. Anna, has been made into a film directed by Spike Lee. The author's book Song Yet Sung is a national bestseller and the 2009 choice of "One Book/One Maryland." In his latest novel, The Good Lord Bird, McBride tells the story of a young boy born a slave who joins John Brown's antislavery crusade-and who must pass as a girl to survive. The Good Lord Bird won the 2013 National Book Award for Fiction. McBride also co-wrote the film Red Hook Summer with Spike Lee, which probes issues of race, neighborhood gentrification, and the effects of drugs and gang violence on the African American community. A graduate of Oberlin College and the Columbia School of Journalism, McBride has written for The Boston Globe, People magazine, and The Washington Post. Also an award-winning composer and saxophonist, McBride has written songs (music and lyrics) for Anita Baker; Grover Washington, Jr.; Gary Burton; and the PBS character "Barney." Through his public speaking engagements, McBride explores issues of identity, race, and heritage. McBride served as keynote speaker at Nova Southeastern University's 2014 Convocation ceremony, an annual gathering of the campus community to mark the beginning of the undergraduate academic year. For more information on the Distinguished Speakers Series, contact the Office of the Dean at (954) 262-8236.